Toyota Kata is one of the most popular books in the process improvement community right now (summer of 2014). I’ve heard it mentioned many times in the past few weeks, so I decided to see what all the hoopla was about. It is definitely worth all the attention! I’ve read a lot about Toyota over the years, and have visited the Georgetown facility, and taken training and been mentored by former Toyota employees, but this book, written by Mike Rother, has greatly increased my understanding of how lean should be applied. This is a lengthy blog, so I will provide a brief overview, prior to the detailed review. Toyota is the benchmark for how to improve your business, based on it’s years of continued success. Toyota has opened up it’s doors to anyone curious to learn, but no one has been able to replicate their success. The reason they haven’t succeeded is explained in this book. Toyota has mastered the art of identifying and solving problems. All of their lean strategy is an attempt to force problems to rise to the surface, so they can be quickly resolved using a standard problem solving approach. That is the “secret” that other companies are not disciplined to follow. Most companies do not embrace problems (usually try to hide them), and they do not use a disciplined approach (called “Improvement Kata”) to solve the problems when they are forced to resolve them. They master the problem solving technique through coaching from management (called “Coaching Kata”), who are experts in using the approach as they worked their way up the company. Improvement Kata is not easy to see during benchmarking tours, and companies leave the tours focusing on the tools, instead of the reason behind the tools. When they implement the tools, it raises up problems, and most companies see this as a problem, and quickly claim that it didn’t work, when in fact it did exactly what it was suppose to do. Let’s first define kata, since it’s in the title of the book. Kata is a set of routines or methods practiced daily. These are not documented or described, but a way of thinking and behaving that is embedded within the Toyota culture. This is why most companies who study Toyota cannot replicate them, despite decades of trying to “reverse engineer” it. Most companies walk away from a Toyota tour with lean tools that are copied (andon, kanban, heijunka, visual controls, mistake proofing, etc) and they do achieve some success, but how they handle problems is not obvious during the tour. In fact, despite what most people think, Toyota does not standardize on tools and roll them out consistently across their factories, they only standardize on the problem solving approach. The tools change as conditions change, depending on the product and service being performed. If you go back and visit Toyota years later, you will see different tools applied within the same assembly lines. They are constantly adjusting and improving. If companies try to replicate countermeasures (improvements), it will not work in other factories because causes and conditions are different. That is the intent of this book, to make it visible to us how Toyota achieves continuous improvement and adapts to change through daily behavior patterns and coaching that supports it. Most companies want to have a clear plan to achieve results. Toyota knows that the details of the plan are unclear, and won’t become clear until extensive investigation and analysis takes place. They set a target condition (what it should look like), and work towards the target, knowing that the path will be uncertain, unpredictable and failures will occur. Failures are when the learning takes place, and that is viewed as a positive outcome at Toyota. If we already think we know the outcome, then we are biased towards a certain outcome, and cannot truly understand the causes of the problem. They use the Improvement Kata methodology to navigate through the uncertain and unpredictable path to a solution, and the leaders know the process will work, so they don’t need to have a detailed plan. This is similar to a lost hiker, looking to get back on the main route. If you can hear the roar of the traffic (vision), you can head in the right direction, but you only have a flashlight that highlights the immediate danger in front of you (problems) that you need to resolve. You cannot see further than your flashlight, nor do you need to look that far in advance, as long as you are still heading towards the sound of traffic. Toyota uses a Plan Do Check Act (PDCA) approach to solve problems. The process compares the current results against the target condition, to see where there is a gap. The target condition is not measurable, but instead it is a description of how the process should operate, and does not include solutions or countermeasures (implement 5S or kanban or change layout). Measures can be manipulated, but process descriptions cannot. If there is no target condition, then after evaluating the current state, a short term target condition (1-4 weeks in the future, no more than 3 months) should be defined. Next, the process is studied and evaluated to understand why the target condition is not being met. This is 90% of the effort, and still part of the Plan phase of PDCA. Once the true causes are understood, then countermeasures are implemented (Do) and checked to see if they move the process closer to the target condition (Check). If not, then the process is analyzed further until the correct countermeasures are achieving results. Once the results are achieved, the process is stabilized, and a new target condition is set (Act). Most companies fall short by skipping past Plan too quickly, spending too much time in Do, then failing to check results, stabilize and set a new goal. They quickly look to move away from this process and work on something new, so they can relax for a while. Toyota does not relax, as they are continuously improving the process and looking for the next problem to occur. In fact, if there are no more problems in the process, then that means there is a problem because the target condition is not challenging enough to reveal the problems. They are striving to achieve a vision of one piece flow, so ignoring problems are slowing up their progress towards the vision. The world and business is always changing. Toyota is setup to continually monitor and adjust to those changes slightly every day. Most companies wait until the change can no longer be ignored, and then they make massive changes to adjust, if they actually decide to embrace the change. Many do not, and fall further behind. Toyota believes that cost and quality improvements are made in small incremental steps, not major projects, events and activities that occur periodically. Daily improvements from everyone in the company is difficult to copy, which gives them their competitive advantage. If your process is not continually improving, then the process must be falling back into a chaotic state, which is how most companies operate. They periodically try to improve processes with major activities, and the rest of the time the process is slowly falling back into an unstable condition. All processes are either slipping back or being improved. Rother describes how action item lists are very common in most companies except Toyota. However, most of the actions are just adding more confusion into the process in an uncontrolled manner, pulling scarce resources in different directions, and not part of a structured system of small, incremental improvements. Toyota strives for only one change at a time, to allow the cause and effect to become clear, not multiple changes at once. Designed experiments (DOE) can handle multiple changes, but it requires expertise to develop a DOE, and that complex approach prevents all employees from experimenting every day. Changing one thing at a time seems slower, but when the feedback is quick, the next change is also quick, so the entire process overall is faster. We can find plenty of actions to take to improve, but Toyota only addresses the problems that are preventing them from achieving the target condition. Most action item lists are just ideas for what could be done, that may or may not help achieve the target, because the analysis and investigation has probably not been done to determine the correct solution (countermeasure). Toyota also has many problems to solve, but only works on the immediate problems that are preventing them from achieving the target condition. Most companies don’t have the patience to wait for the analysis and investigation, and instead reward action that is taken immediately, not results achieved in the future. Long action item lists do not lead to more improvement, they give us a false sense of accomplishment, and can take ownership away from the team (“I completed my actions, so it’s not my fault the process is still broken”). In fact, once a few changes have been implemented, it may eliminate the need for other actions on the list, yet they still get implemented anyways. Now we have a new process completely that we aren’t sure if it is better than the previous process. Most companies focusing on “making production schedules” but Toyota focuses on continuously improving the process. “Making production” drives companies to hide and work around problems. “Continuously improving” drives Toyota to find and remove problems, so the chance of making production in the future is more likely. By focusing on stabilizing and continually improving the process, the outcomes will naturally come to fruition, instead of people “firefighting” and performing heroics to make schedule. Most companies manage to the outcomes only, focused on results, not the process that drives the results and how they were achieved. Toyota considers it a negative if problems are hidden or not discovered, so they setup their processes to expose weaknesses quickly and often. This is counterintuitive to most companies, who want to achieve short term results like “make production schedule” only, and think they can replicate those results over the long time without addressing the root causes of the problems. Toyota cannot manage the process if the problems are not visible, as they realize they won’t be able to achieve consistent results in the future if the problems are hidden. Problems at Toyota are not viewed as good or bad, simply a problem that was expected to occur on their way to the target condition. They do not blame operators for problems. They assume that people are doing their best, since they feel that changing out people in a process will likely result in the same problem occurring (most problems are system issues), and teamwork is needed to solve problems (not pointing fingers). That being said, they do not have a laid-back attitude of problems, quite the opposite. It is a diligent focus on solving problems using the Improvement Kata. 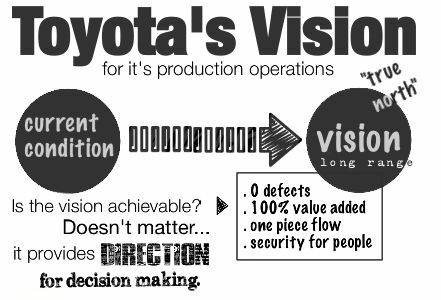 Toyota uses a broad vision to help move the company in the right direction “One piece flow at lowest possible cost”. This helps align the company, especially when departments argue about who will need to take on some inefficiency to help the overall company become more efficient. The example that Rother shares is a logistics manager trying to optimize their process of delivering parts to the factory. The improvement idea presented by the team was to make Logistics unpack and present the parts to the factory, and deliver more frequently in smaller batches. This takes more time, and Logistics see that extra work as waste and slowing them down. However, to the overall process, it’s less waste to the factory, which is the best decision overall. Without a vision, the departments will struggle to determine who should take on more waste in the short term for the betterment of the entire value stream, and to help move the company towards the vision. The vision also keeps teams from working on the wrong problem. Another example provided was the situation where a team needs to increase the number of machine setups, to strive closer to one piece flow. This change will increase the number of setup checks and quality paperwork. Instead of looking for other solutions (because that will increase these tasks), Toyota will proceed with the change because it helps move them closer to their vision. They quickly shift their focus to reduce the impact of the additional setup checks and paperwork, instead of looking for different solutions. This concept of letting the goal drive activity also carries over with Cost Benefit Analysis and ROI calculations. Instead of using it as a gate for taking action or not, Toyota only uses these financial analyses to help decide which solution is best, or what needs to be done to make it more feasible. If the solution is moving them closer to their vision, then it needs to be done. The analysis is just supporting how to get there, not whether it should be done or not. If the payback is too long, then alternative solutions must be developed to reduce the cost, so it will be more favorable financially. When teams are empowered to come up with more cost effective solutions to support the vision, they have seen impressive results. Toyota manages the process, whereas most companies manage the results only. If you manage to results, there are many ways to achieve the outcome you want, and most of those ways are detrimental to the business and create a false sense of achievement. Toyota adopted many of Ford’s assembly line and conveyor system approach, but built the flexibility and problem solving aspect into the model. They are constantly striving to achieve a conveyor system for every product, which is what Ford was trying to achieve (although with only one product). Rother goes through some history of Ford and Toyota and how they developed into the company they are today. Rother also explains that most management practices utilized in companies today are not actually flawed, but need to incorporate continuous improvement and adaptability in order to align with Toyota and keep up with changes in their industry. Common lean tools like Heijunka (Leveling production), kanban (pull systems) and supermarkets are viewed by most companies as ideal states (after they tour a Toyota facility), but Toyota views them as temporary states to help them achieve their one piece flow vision. The real intent with these common lean tools is to create a target condition, so that the process can be evaluated against it, and problems can rise to the surface (when the process fails to achieve the target). Instead of setting up a schedule that is achievable in the short term (like most companies), Toyota will establish a schedule that is not achievable, and work the issues so that it will eventually be achievable. They will then remove the temporary systems (kanban, heijunka, supermarket, etc) so they can continue to move towards one piece flow. Pareto charts should not be used as often as they are. They tend to be utilized far too late, after the problems have happened, and when the causes are no longer around to observe. Many times, the “Other” category is the biggest issue on the chart, which still requires additional analysis or data collection. Toyota feels it is better to solve problems as they come up, as you will eventually encounter the biggest and most critical problem, rather than spend time analyzing old data in an attempt to identify the biggest problem. Old data means old information about what happened. Toyota focuses on quick responses to problems as they occur, when the root cause is still able to be found. Toyota looks for temporary solutions, in order to continue further towards the target condition, instead of coming up with perfect solutions that takes weeks, months and lots of money to implement, and expecting them to be in place for years. If a team is continually improving, today’s solution may be improved upon tomorrow, so why spend lots of time and money on something that might change again. He relates a personal example of how a team he worked with spent lots of money and changed priorities for many departments to expedite a new rack system, only to request changes to it the next week. Rother describes the 5 questions, which are at the heart of Improvement Kata. When done correctly, using PDCA and comparing the current condition to the target condition, the countermeasure will become obvious, and it will often times be simpler, easier and more effective than expected. Rother provides an example of a damaged fan blade that resulted in tightening a screw on a fixture, instead of a complicated mistake proofing alignment device or additional operator training that was initially proposed, before the full analysis was completed. One misconception about Toyota is that the lowest level employees are empowered and given time to solve problems. They are empowered to provide input, but other team members actually observe the process and solve the problems. The operators are expected to follow the standard, and pull the andon cord when they encounter problems. If they spent time working on solving the problems, that would prevent them from stabilizing the process and becoming experts on the standards. They also do not have improvement experts, since everyone’s job is to solve problems by using the Improvement Kata, that they were taught and coached on how to follow. When mentoring employees on the Improvement Kata, Toyota makes sure that the mentor does not suggest solutions, but instead only asks leading questions, and makes sure the next step proposed by the mentee is logical. If not, then the mentor provides suggestions and helps them through the next step. If they have a better idea than what the mentee suggests, but the mentee is able to move towards the target condition with their own solution, then the mentor cannot suggest their idea, otherwise it ruins the relationship. It would fall back to the mentee wanting to constantly ask “tell me what to do” and not learning how to do it themselves. They also suggest that a written document (A3) should support any coaching sessions. Otherwise it’s too easy to divert from the target condition and get off track. Keep mentoring sessions at 15 minutes to keep the mentee focused on the next step only, not jumping too far ahead, and they encourage them to increase the frequency of coaching cycles. The mentoring should take place often but for short durations. A good mentor-mentee relationship will meet multiple times per day for minutes at a time, instead of on set schedules (one hour per week). If the mentee is not successful, then the mentor is not doing their job, and should use Improvement Kata to figure out why. It is imperative that the mentor take ownership in the outcomes of the mentee, so they are both accountable for results. How should companies implement Improvement Kata? For companies to begin to adopt Toyota’s kata practices, consider starting with Toyota’s vision of “one piece flow at lowest possible cost,” since that can apply to any business. This book could have been titled “The Toyota Secret” as it clearly explains why Toyota has been so successful, but why most companies cannot replicate what they’ve done. If you are just starting out in process improvement, or are an expert or consultant, you will find this book very beneficial, and will want to read it more than once, in order to make sure the message and recommendations are embedded in your memory. August 23, 2015 bizpi Comments Off on Which lean event type should I do first, Value Stream Mapping or Kaizen Burst?